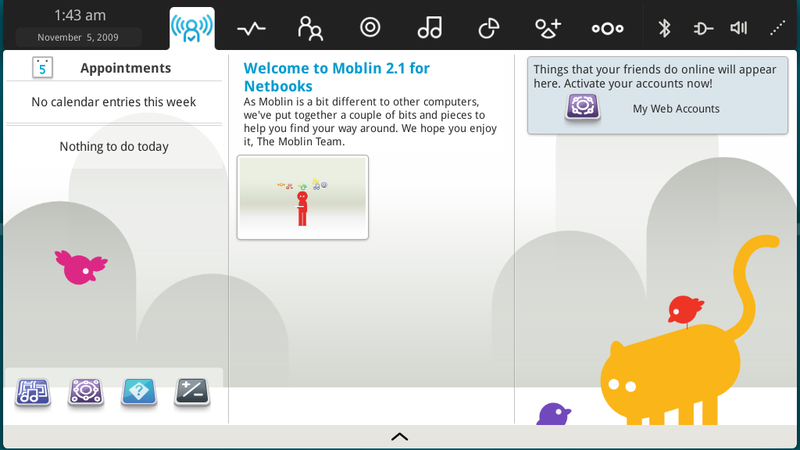 Moblin was an open source project focused on building a Linux-based platform optimised for mobile devices including netbooks, mobile Internet devices, and in-vehicle infotainment systems. The central piece of the architecture was an independent layer that provides one uniform way to develop such devices. Underneath the Moblin Core sits the Linux kernel and device drivers specific to the hardware platform, and above the Moblin Core are the specific user interface and user interaction model for the target device. 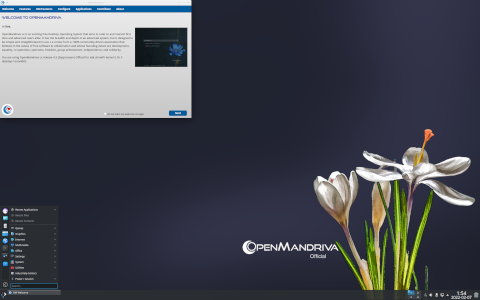 Rate this project OpenMandriva Lx, a desktop-oriented Linux distribution featuring the KDE Plasma desktop, has been updated to version 3.03. This version marks the end of the 3.0 series and also end of life for OpenMandriva 2014.x: "This release of OpenMandriva Lx is an enhancement and upgrade to the previous Lx 3 releases. With it you'll get even faster booting than before, so fast in fact that it's sometimes quicker than the BIOS. Even the live image boots faster than before. At the hardware level there is an up-to-date kernel 4.13.12, systemd 234 and, for your graphics stack, MESA 17.2.3 with a S3TC support enabled and X.Org 1.19.5. Our main desktop environment, KDE Plasma, is updated to 5.10.5 and Frameworks are at 5.39. Everything with this release, including the new Firefox Quantum 57, is compiled with LLVM/Clang 5.0.0. This release will be the last in the 3.x series and also the last to support i586. In the next release applications, such as wine32, will be supported by providing i586 libraries. This marks the end of support for OpenMandriva 2014 and for some, this will be a sad day as it was a fine release." See the release announcement and release notes for further information and screenshots. Download: OpenMandrivaLx.3.03-PLASMA.x86_64.iso (2,155MB, MD5, pkglist). The OpenMandriva distribution is a full-featured Linux desktop and server, sponsored by the OpenMandriva Association. The project has published a new development snapshot, OpenMandriva 4.0 Beta, which offers several improvements and package upgrades. "Our first release in 2019 is OpenMandriva Lx 4.0 Beta, a close preview of the upcoming final release. Since Alpha1, OMLx 4.0 got a huge number of fixes and improvements. You may already be aware of some of them having read OpenMandriva Lx 4.0 Alpha1 follow-up, some more came afterwards. Live mode: ISO menu new entries for language and keyboard preference. Upon user's request, KPatience card games have been included in ISO (live mode only). Calamares new features: Easy swap partition option; Calamares log copied to successfully installed system; Automagically removing all unused languages at the end of installation; Calamares now checks whether system is installed in VirtualBox or in real hardware. If in real hardware it removes unneeded VirtualBox packages." Further details can be found in the distribution's release announcement and release notes. Download (MD5): OpenMandrivaLx.4.0-beta-plasma.x86_64.iso (2,041MB, torrent, pkglist). Cristina Sgubbi has announced the availability of the first development build of the upcoming OpenMandriva Lx 4.0. The new version brings a change in the package management department (a switch to RPM 4 and dnf) and the distribution is now compiled with Clang 7.0: "Today we are proud to introduce you to the OpenMandriva Lx 4.0 major release alpha 1. Big changes have happened - we switched to RPM 4 and dnf as the software package manager. We have had massive updates in the core system and rebuilt everything with Clang 7.0, giving you a significant speed increase. OMLx 4.0 now includes complete ports to AArch64 and ARMv7hnl platforms and has started a port to RISC-V. We have also built a version specifically for current AMD processors (Ryzen, ThreadRipper, EPYC) that outperforms the generic version by taking advantage of new features in those processors. Main features: KDE Plasma 5.14.4, KDE Frameworks 5.53.0 and KDE Applications 18.11.90...." See the release announcement and release notes for more details. Download (MD5): OpenMandrivaLx.4.0-alpha1-plasma.x86_64.iso (2,340MB, MD5, torrent, pkglist). A special "znver1" build optimised for the current range of AMD processors is also available: OpenMandrivaLx.4.0-alpha1-plasma.znver1.iso (2,441MB, MD5). The builds for the AArch64 and ARMv7 architectures were not yet ready at the time of writing. The OpenMandriva project is a fork of the Mandriva family of Linux distributions. The project's latest release, OpenMandriva Lx 3.02, features a number of package updates, including the Plasma 5.9.5 desktop environment, Wayland 1.12.0, systemd 233 and version 4.11 of the Linux kernel. OpenMandriva's kernel uses the BFQ scheduler for improved desktop performance. The project's release announcement declares: "The distribution ISO is bootable in BIOS or UEFI from USB stick or DVD and uses the Calamares installer to guide you through installation with the minimum of effort. The ISO also offers a means of booting EFI partitions should they become inaccessible because of boot order changes. This distribution has been successfully installed and run on a dual-graphics chip notebook using Bumblebee. A working i586 image is available however this will only install on genuine i686 boxes. If your machine is 64-bit please use the relevant 64-bit image. Main features in this release: KDE - Frameworks 5.33.0, Plasma 5.9.5, Applications 17.04, Qt 5.8.0; display subsystem - X.Org Server 1.19.3, Wayland 1.12.0, Mesa 17.1.1; core - Linux kernel 4.11.3 (with BFQ as default I/O scheduler and UKSM enabled), systemd 233, LLVM/Clang 4.0.1, GCC 6.3.1, glibc 2.25...." Additional information and updated package versions can be found in the release notes. Download (MD5): OpenMandrivaLx.3.02-PLASMA.x86_64.iso (2,050MB, torrent, pkglist). Kate Lebedeff has announced the release of OpenMandriva Lx 3.01, an updated build of the distribution's 3.0 branch, featuring the KDE Plasma desktop, which was originally released in August: "Not long after Lx 3.0 final release we are proud to announce OpenMandriva Lx 3.01. The 3.01 release brings a number of major fixes - updated software; new drivers and kernel with better support for newer hardware; many bug fixes; stable Plasma running on Wayland. OpenMandriva Lx is a cutting-edge distribution compiled with LVM/Clang. Combined with the high level of optimisation, it gives the desktop an unbelievably crisp response to operations on KDE Plasma 5 which makes it a pleasure to use. The latest release of all the KDE applications is there to support the desktop and help give you a consistent feel. Main features: KDE Plasma 5.8.4, KDE Frameworks 5.29.0, KDE Applications 16.08.3, Qt 5.6.2, Linux kernel 4.9 with BFQ as a default CPU scheduler, systemd 232..." Here is the full release announcement. Download (MD5): OpenMandrivaLx.3.01-PLASMA.x86_64.iso (2,018MB, torrent, pkglist). Kate Lebedeff has announced the launch of OpenMandriva Lx 3.0. The new version features the Calamares system installer, improved boot times and has been compiled using the Clang/LLVM compiler. "OpenMandriva Lx is a cutting edge distribution compiled with LLVM/clang. Combined with the high level of optimization used for both code and linking (by enabling LTO) used in its building, this gives the OpenMandriva desktop an unbelievably crisp response to operations on the KDE Plasma 5 desktop which makes it a pleasure to use. The latest release of all the KDE apps is there to support the desktop and help give you a consistent feel. Main features: KDE Plasma 5.6.5, KDE Frameworks 5.24.0, KDE Applications 16.04.3, Linux kernel 4.6.5, systemd 231, X.Org Server 1.18.3, Mesa 12.0.1, F2FS support - a filesystem for SSDs." Additional information on the new OpenMandriva Lx 3.0 release can be found in the project's release announcement and in the release notes. Download (MD5): OpenMandrivaLx.3.0-PLASMA.x86_64.iso (1,891MB, torrent, pkglist). Kate Lebedeff has announced the release of a new development snapshot for the OpenMandriva distribution. The new release candidate, OpenMandriva 3.0 RC1, introduces Chinese and Japanese translations, offers 32-bit (i586) support and fixes bugs in the GnuPG package. "Work for the RC1 has further improved stability and performance. We have now support for the Japanese and Chinese languages so we would really welcome any feedback from those who speak them. The RC1 brings a number of major fixes: i586 release now available; install with Calamares now functional so no longer necessary to install through live image; a longstanding GnuGP bug has been fixed. OpenMandriva is a cutting edge distribution compiled with LLVM/Clang. Combined with the high level of optimization used for both code and linking (by enabling LTO) used in its building, this gives the OpenMandriva desktop an unbelievably crisp response to operations on the KDE Plasma 5 desktop which makes it a pleasure to use." Further details can be found in the project's release announcement. Download (MD5): OpenMandrivaLx.3.0-RC1-PLASMA.x86_64.iso (1,863MB, torrent, pkglist). The OpenMandriva project has announced the launch of a new development release. The new version, OpenMandriva Lx 3.0 beta 2, ships with Linux kernel 4.6.2, systemd 230 and is perhaps the only Linux distribution to feature packages built with the Clang compiler. "This second beta has concentrated on improved stability and performance and now, for the first time, has accommodation for the Chinese and Japanese languages using fcitx to support their input methods. OpenMandriva is a cutting edge distribution compiled with LLVM/Clang. Combined with the high level of optimization used for both code and linking (by enabling LTO) used in its building, this gives the OpenMandriva desktop an unbelievably crisp response to operations on the KDE Plasma 5 desktop which makes it a pleasure to use. The latest release of all the KDE apps is there to support the desktop and help give you a consistent feel." Further details can be found in the project's release announcement and in the release notes. Download (MD5): OpenMandrivaLx.3.0-beta2.x86_64.iso (1,861MB, torrent, pkglist). The OpenMandriva project has announced the availability of a new beta release for OpenMandriva Lx 3. The new testing release features KDE's Plasma 5.6 desktop running on Wayland. The distribution also offers the LXQt and Xfce desktop environments as lightweight alternatives. "This Beta 1 release is the culmination of over a year's effort and offers features that set it at the leading edge of software technology. The use of the Clang/llvm compiler to generate the majority of the code combined with Link Time Optimization (LTO) has created an operating system that is fast stable and efficient. The release features the latest KDE Plasma 5.6 based desktop along with full KF5 framework of apps which are supported by version 1.18.2 of the Xorg server and Mesa 11.2. KDE Plasma 5 now runs under the Wayland graphical server which offers smooth and fast graphical rendering. This configuration is experimental." Further information and screen shots can be found in the project's release announcement. Additional technical details can be found in the release notes. Download (MD5): OpenMandrivaLx_3beta1.x86_64.iso (1,652MB, pkglist).